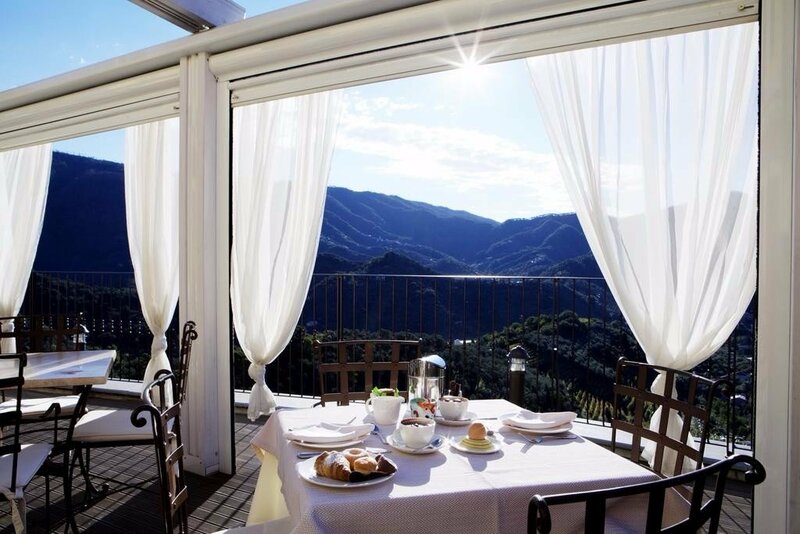 Costa di Faraggiana is a luxury agriturismo near Cinque Terre, Liguria, and a place to spoil yourself a lot. You can have the full Italian Agriturismo experience on the organic farm with vineyards, olive trees and the finest of food, while also enjoying a full range of spa and wellness treatments; Turkish bath, sauna, sensory shower, various massage and beauty treatments etc. The views are stunning from the farmhouse and there is a nice, and very well positioned to enjoy the view, infinity swimming pool and hot tub, and you’ll find the rooms and services on offer very much luxury hotel standard. They have a range of rooms and suites to sleep up to four people. You’ll find them all very comfortable, spacious and beautifully decorated with pastel shades and nice antique pieces throughout. Every room has a seating area, study desk, and a very plush bathroom. And all of them will have access to some of the beautiful views that surround, with some of the more expensive options coming with a private terrace or balcony and outside seating. All the accommodation is B&B and there is a fantastic organic breakfast to look forward to, with lots of interesting sweet and savory options, many made with ingredients from their own gardens, and dietary restrictions will be well taken care of too. Between spending your time enjoying the infinity pool or hot tub and the fabulous food, you can also avail of some of their many spa, wellness & beauty treatments. On a hillside overlooking a lush green valley Agriturismo Costa di Faraggiana has an enviable setting. For the energetic amongst you the hills surrounding make for some wonderful hiking with, in some parts, tremendous views over the town of Levanto and the Cinque Terre coastline. The agriturismo owners can arrange horse riding trips for you in the local too and they also have mountain bikes and scooters for rent. Levanto, at the edge of the Cinque Terre, is less than 3km away from Agriturismo Costa di Faraggiana and you can avail of the free shuttle service to and from there and the beach. From there you can set off on a tour of the five villages of the magnificent Cinque Terre coast. Boat tours are popular from Levanto which is probably by far the best way to appreciate the beauty of this very special stretch of coastline. The agriturismo owners actually do very good boat tours themselves, taking in the five villages plus some other little gems like hidden coves, caves and beaches. The nearest airports are at Pisa and Genoa, both around an hour away , and you can arrange transfers to and from each.